Seasons are a funny thing here in Missouri – the arrival of Autumn simple means uncertainty when it come to the weather. Sometimes it’s 95 in mid-August, then drops to the 70’s in late August, and then spikes back up into the 80’s in September. And then you might have a two-week stretch where every window in the house is open for another two weeks straight. Those are the weeks where it’s hard to get out of bed in the morning because the overnight low was 50 degrees and you know that the outside air has chilled the house. Those are the mornings you are racing to the coffee pot for a hot cup of coffee. Those are the weeks that beg for you to dig to the back of the closet and dust off the scarves, the house slippers and your old high school hoodies Those are the weeks I want! And also, that means it is SOUP weather! Now, don’t get me wrong, I will (and do) eat soup year-round. But something about that first drop in temperature just makes me crave soup. And that’s where today’s enchilada soup comes into play! I think enchilada soup is probably one of my favorites – to make and to eat. So many flavors and textures going on in there and (best of all) tortilla soup is SO simple. Because of all of the flavors going on, it’s one of those soups that does not have to cook all day long to have a ton of flavor. And for a working person diving head first into her busy season at work, I will welcome that kind of meal any day! So cheers to scarf, slipper and hoodie and SOUP season! 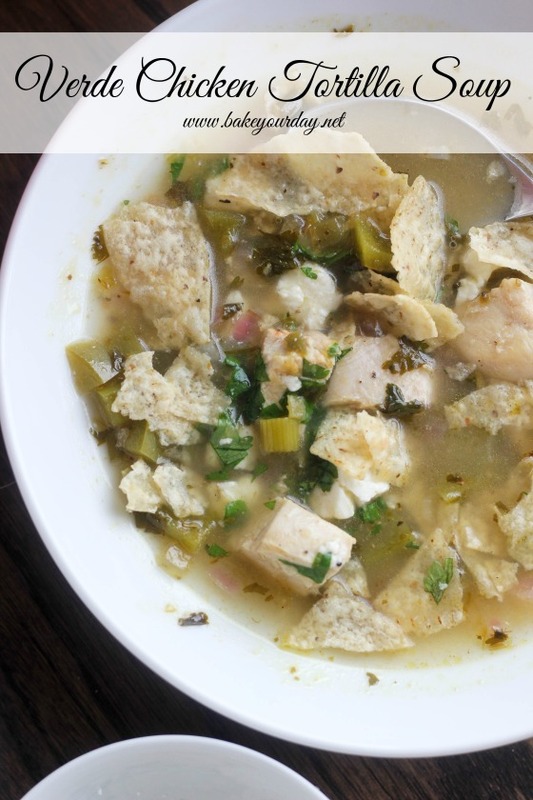 Head on over to the Aldi Blog to check out the recipe for Verde Chicken Tortilla Soup! Disclaimer: This post was written by me in sponsorship with Aldi. All opinions are 100% my own. Thank you for supporting the brands who support Bake Your Day. This soup looks unbelievable! Pinned! It’s still in the 90’s where I am. Looking forward to it cooling off so I can make soups like this. Delicious! This is right up my alley! So comforting and delicious! I was SO cold this morning. But then I kept thinking about how 50 degrees is not cold compared to the 15 it will be in a couple months… Yikes. This soup is the perfect warm up!! Comfort in a bowl! Love this soup! Gooooooorgeous soup! My favorite flavors! This soup looks amazing and so dreamy. SO happy it’s soup season! I can’t wait to add this one to the menu — it looks super yummy! This looks delicious! I’m so happy it’s soup weather! I love chicken tortilla soup! Nothing says comfort to me more. . heading over now to check out the recipe! We’ve had the same crazy fluctuations in temperatures here in Ohio. I’m ready for cooler mornings, just not really COLD. I made soup the other night even though it wasn’t the plan, and told my husband I was just craving soup. He was like, ummmm you realize we’ve had soup three times this week, right? Woops! Can’t get enough! 🙂 I’m excited to add this one to the line up. It’s still in the 90’s with 800% humdity in FLA, but we eat soup regardless. 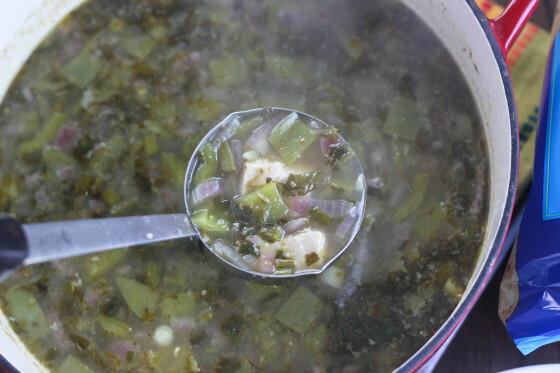 Yummy looking soup Cassie, if I have a choice of red or green chilies, I almost always go for green! this is so seasonally perfect right now. bring on the comfort food! I could eat this soup 2342362432 times a day. Sounds like a great soup for a cool evening. Now if this hot spell we’re having here in SF would only end so I can have some proper fall weather, I would totally make this! it’s definitely been on the warmer side here lately, but I still want ALL THE SOUP. This sounds like the perfect way to warm my belly! I am definitely craving soup too! This one looks particularly tasty! I might have to make this today! looks so good! Love any soup with these flavors.